Whenever we see a strange datapoint -- something that hasn't happened for decades, its worth noting. Recall in 2005, the US Savings rate first slipped to zero. 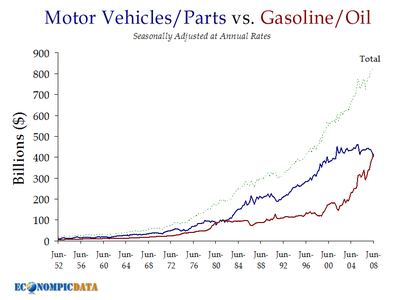 "Consumers spent more on gasoline than vehicles and parts for the first time in 26 years in May and June, as U.S. pump prices headed for a record. Record prices at the pump are already affecting U.S. gasoline demand, which sank to a five-year low in the first seven months of the year, according to the American Petroleum Institute in Washington. The decline in demand has slashed sales of automobiles and cut consumer spending. Auto sales fell to the lowest in 15 years in July and partly accounted for retail sales dropping for the first time in five months. Consumer spending makes up more than two-thirds of the U.S. economy." This is yet another example as to why the focus on Core Inflation is so silly . . .
1982. Rings a bell. What was happening back then? Oh yeah. The United States was experiencing its worst recession since the Depression, with conditions frighteningly reminiscent of those 50 years earlier. By November 1982, unemployment reached, nine million, the highest rate since the Depression; 17,000 businesses failed, the second highest number since 1933; farmers lost their land; and many sick, elderly, and poor became homeless.